The first publication from the MHF's landmark Haringey Man MOT project is now available. 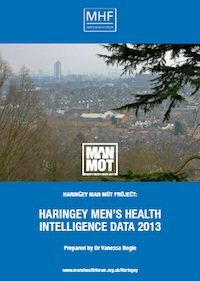 The Haringey Men’s Health Intelligence Data 2013, which pulls together all the health information for men in the borough from a variety of sources, shows a fall of nearly TEN years in life-expectancy between the west and east of the borough. The data will be used to inform the next stages of the Man MOT project which is all about setting up an online health information service designed by and for Haringey men. Prepared by Dr Vanessa Bogle, the data, along with primary research carried out on the streets of Haringey and online, will feed into the design of Man MOT, its chat interface and the services and information it provides. The project will also be publishing a separate piece of secondary research looking at studies around men, health and information technology. MHF CEO Martin Tod said: 'This is not just invaluable data for the Haringey Man MOT project, it is invaluable information for everyone who is interested in health in the borough. There is a 9-year gap in male life expectancy between men living in the more deprived areas (east) compared to those living in more affluent areas (west). The greatest contributors to the male life expectancy gap are heart disease, stroke, cancer, alcohol, lung disease and deaths in men aged over 40 years. Men accounted for 67% of smoking-related admissions to hospital in 2011/12. Coronary heart disease, stroke and heart failure emergency admission rates in males are significantly higher than female admissions rates compared to both the national and London average. More than three-quarters of men are not regularly physically active. The incidence of cancer is high in males compared to the England average and premature mortality rates in males are also high compared to men nationally. Men in Haringey have the highest death rate in London due to alcohol and rank 6th in London for its rate of alcohol-related hospital admissions, of which the majority come from the east of the borough. Haringey ranks 10th highest in London for its rate of drug misuse and 75% of the drug treatment population are male. Rates of psychotic disorder are the third highest in London. Suicide in men is higher than the England average and between 2008-10, 81% of suicides were amongst men. Men represent only 31% of referrals to the Improving Access to Psychological Therapies. Rates of sexually transmitted infection are worse than the England average.